Canterbury of New Zealand is a New Zealand-based sports clothing company that focuses on rugby football. The company is named after the Canterbury area in New Zealand where the company started to make knitwear. Other than producing rugby kits, the brand is also known for their rugby protective wear such as headgear and pads, and rugby boots. The company also manufactures and markets lifestyle clothing. The brand's tagline is "Canterbury: the world's original rugby brand". 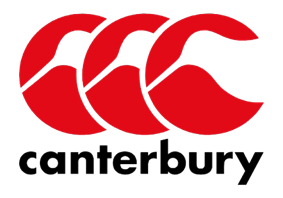 Its logo is the silhouettes of three birds (Kiwis) on three solid circular backgrounds creating the letters CCC; the initials of the Canterbury Clothing Company. The brand is distributed widely among rugby-playing nations. The head office was formerly based in the city of Christchurch in Canterbury in the South Island, but has now moved to Auckland. There are operations in Brisbane, Australia; Emeryville, USA and Manchester, UK. The brand is also manufactured and marketed in Japan under licence by Canterbury of New Zealand Japan. In 2006, Canterbury sold its South African operations to investment group House of Monatic, which set up Canterbury South Africa to run these operations under licence. The European arm, Canterbury Europe Ltd, based in Stockport, was purchased by JD Sports in 2009, then sold on in 2012 to sports and fashion retail group Pentland Group for £22.7m. Following Petr Čech's head injury in 2006, Canterbury supplied his protective rugby-style helmet until adidas decided they would supply the helmet. Canterbury of New Zealand is the wholesale provider of sportswear to the sports teams at Northumbria University in Newcastle-upon-Tyne, with the exception of the Gaelic Football Team whose kit is manufactured by O'Neills. The company is also sponsors the men's and women's rugby union clubs at University of Exeter. ^ Rossingh, Danielle (29 January 2009). "South African Rugby Team’s Kit-Maker Files for Liquidation". ^ Wallop, Harry (2 March 2012). "Nike loses England rugby shirt deal to Canterbury". Telegraph (London). ^ Pearce, Nick (19 September 2012). "England unveil new 2012-13 rugby kits ahead of autumn internationals". Telegraph (London). ^ "JD Sports buys rugby shirt brand". BBC News. 4 August 2009. ^ "Rugby brand Canterbury sold by JD Sports". BBC News. 23 August 2012. ^ "Scottish Rugby Secures Biggest Ever Sponsorship" (Press release). Scottish Rugby. 24 January 2013. ^ "England Legends Launch Canterbury’s ’1871′ Collection at Twickenham".